I got into railroads in a big way starting Christmas, 1982 when my kid brother got a train set and, in addition to model railroading, I really got into collecting books on railroad history - especially the railroads of New England. Sometime in 1985 (had to be, cuz that was the first year I could drive), I went to a RR slide show/house warming at a friend's new house. While there, he showed me his RR book collection which contained volumes that made up my mental "must have" list for many years thereafter. 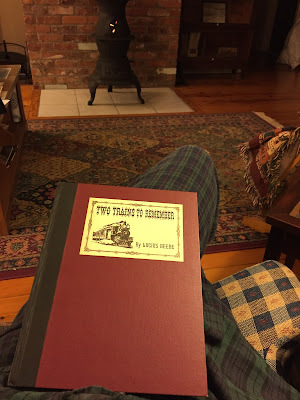 But among what - to me - were a number of rare and priceless tomes, he had a favorite - the prize of his collection: "Two Trains to Remember" by Lucius Beebe. Beebe is well-known among railroad collectors as the author of such well-known (and widely available) books as "The Trains We Rode" and "Mixed Train Daily." During the late 1950s and 1960s, his writings saturated the libraries of just about every railroad enthusiast around - and they're still widely available in used bookstores - and online - today. But there was one book he wrote that was his acknowledged favorite. Most of the illustrations it contained had been previously published elsewhere, and even much of the information had been included - though scattered about - in his other writings. But he wanted everything together within one cover, to commemorate two by-gone luxury trains that his grandfather had ridden . . .
"Two Trains to Remember" - the story of the New England Limited and the Air Line Limited, otherwise known as The Ghost Train. He had just 300 copies privately printed and sent them as gifts to friends and relatives, signing every one personally. With such a backstory, and given its rarity, this book had grown to Grail-like proportions in my mind and I've been looking - off and on - for a copy of this book ever since I first saw it at my friend's house over 30 years ago. For many years, I never even saw another copy, much less heard of one being available. Sometime in the early 1990s, I saw one sitting on the shelves of the Russel Library in Middletown, CT (one of the Limited's only stops between New York and Boston - it flew through the NYNH&HRR's namesake city of New Haven without even stopping). I'm not gonna lie - I was sorely tempted to "liberate" that copy and "give it a much better home." But I resisted. If it's not still at the Russel, it's not my fault . . . I was an early adopter of the "new" online auction site eBay, joining way back in 1996 for the express purpose of saving a search for this book so that I'd receive an email when one became available. For many more years, no such email ever arrived in my in-box. In recent years however - due to the unfortunate, but just as inevitable, attrition that occurs with the passage of time - railroad fans have moved on to the Great Roundhouse and their collections have become available, and, with them, the occasional copy of TTTR. But the asking prices have always been prohibitive. And while I've "watched" those auctions on eBay, I'd eventually delete the emails announcing them. That was all well and good until I turned my research and modeling attention to the Connecticut Valley Lines of the New Haven Railroad - including the Air Line and the right-of-way over which the "Two Trains to Remember" had rolled. My interest in finally possessing this book, which had always been high, now pegged the meter. Amazingly, a couple of weeks ago, I got an eBay email announcing another copy - and at a ridiculously low (relatively) opening bid. I put my usual "watch" on it, looking forward - once again - to seeing what crazy final price it would command (I'd devolved to taking smug satisfaction in not paying such exorbitant prices "even if I could" which, of course, I couldn't no matter how badly I wanted to). As the Final Day of the auction approached, incredibly, there were still no bids. I wasn't too surprised - I'd seen these bid up to rarefied heights during the final hours/minutes before - and knew that, unlike those halcyon days in the mid-1990s, there's sniping software these days that will automatically put in a winning bid for you during the final seconds of an auction. But I have no such software, so I just waited. During the final minutes, seeing that the book I'd searched for and longed for for so long was still sitting at the opening bid, and still with no bidders, I logged in and waited . . . figuring I'd enjoy the show as the bidding started and accelerated at a frenzied pace. As the seconds ticked down and my pulse started racing, I figured "why not" - I threw up a bid and hit "enter" with, literally, four seconds to go. Yup. Got it. And there were no other bidders. All of us, at one time or another - and some more than others - think the Universe is out to get us. But sometimes, everything lines up just a certain way and you're reminded that there, in fact, is a God. And He loves us. And as additional evidence, I discovered that the seller works in a nearby town. Given what I "saved" I could've easily sprung for the shipping, but given the vagaries of postman and weather, I decided to pick up my prize in person. The photo above was taken that evening, as I enjoyed a fire in my RR stove and opened its cover to read it from the first page to the last in one sitting, savoring every moment. And thus, a 32 year search ends and a yawning gap on the shelves of my railroad library is filled. Thanks George! Glad you liked the story and thanks for stopping by! Friday Fun - Valley Line Book! Modeling Monday: DERS-1b (RS-1) #0669 - DONE!